Ballast water is used to stabilize boats and ships. Watercrafts that carry cargo use load large amounts of ballast water, which is later discharged in a different region when the cargo is unloaded. This discharge contains many biological materials, including plants, animals and bacteria. Thus, ballast water discharge is believed to be one of the biggest transporters of invasive species! Much research has been done to remedy this problem. 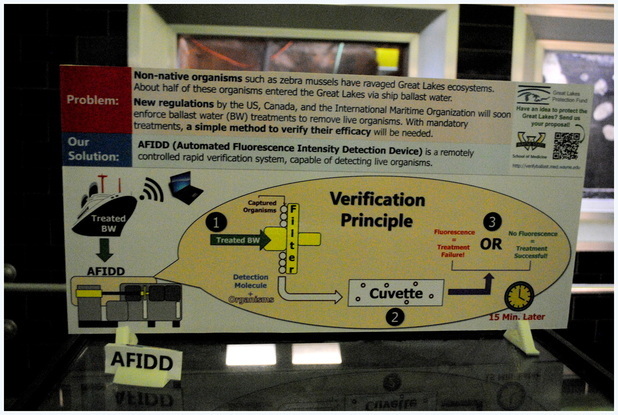 Check out Wayne State University's Ballast Water Verification System Model at the Aquarium and click on the large photo below to learn more!